Pipe cleaning is a crucial process in helping to prolong the life of industrial pipes. Due to the nature of what these pipes are used for, the accumulation of materials can often occur over time. Having a build-up of these deposits consequentially reduces the performance and efficiency of the pipes, through reducing flow rates and implementing varying pressures. Not maintaining industrial pipes can lead to costly damage that can end in a company having to replace its industrial pipes; a heavy cost that can be avoided. Pipe cleaning is an arduous task due to a number of reasons. Pipes often involve various bends and turns that can make it hard to clean the whole length of the pipe. Additionally, pipes are often hard to access, particularly when they are part of an enclosed system. Limited access makes it hard to reach certain areas by hand. And of course, there is the vast differences in the diameter and length of pipes. These differences require a method that will work for all sizes. High-pressure water is able to cut through the build-up of even the hardest of materials inside the pipes, even concrete, and is able to clear the pipes completely. This allows pipes to return to their usual productivity and consistency. Traditional methods of pipe cleaning involve the operator working within the vicinity of the cleaning, opening up many health and safety risks to all workers involved in the process. It is because of this that there has been a need for a new, safer, and more efficient method. Introducing the Peinemann! The Peinemann XLTC is the most effective and also the safest method of conducting industrial pipe cleaning. This handling system takes the operator away from the blast zone and is therefore a lot safer. This is done through the Peinemann being controlled remotely, which is also beneficial due to the fact that a constant speed is maintained, providing a consistent method and result that is hard to achieve during manual cleaning tasks. This equipment is extremely lightweight; only 10kg. The compact design means that it can reach even the hardest to reach spaces. 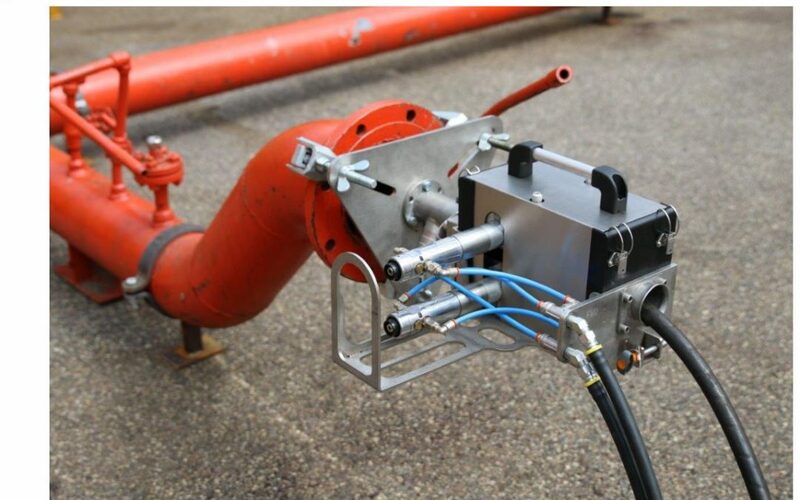 This innovative piece of equipment is easily fitted to the pipe by a single operator, reducing the number of workers needed to carry out a task. The Peinemann can clean both ends of the pipe equally, due to front and back cleaning. Because of this efficiency, productivity and cleaning quality is considerably improved through this pipe cleaning solution. At Hydroblast, we use the best equipment to carry out a task. Our extensive knowledge and training means that we are able to provide efficient pipe cleaning using the latest innovations. If you require cleaning of your pipes, do not hesitate to contact us to find out more. Hydrodemolition: Why do we have Robots? How Hydrodemolition Differs on Small and Large Scale Projects | Hydroblast on Hydrodemolition: Why do we have Robots?